After seeing an episode of Jon & Kate plus 8 where the sextuplets stated to do simple household chores. I figured it was a good time to have my daughter start to help out around the house too. I DVR’d the episode and we watched it over and over until she got the hang out of chores. Thanx Gosselin’s! I searched E-bay for a chore chart and this single little creation has changed my life and made everyday arguments with her disappear. Everyday when my little one completes her chores she gets a flower magnet for whatever task she completed. This past week she had a great week and got all flowers! Yay! 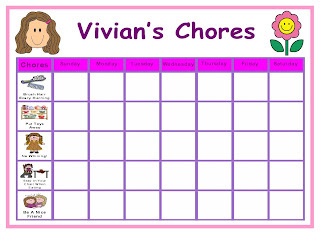 To go along with her chore chart we made 3 special boxes with reward/activity cards. After she brushes her hair in the morning she gets to pick from the first box. There are 10 cards in this box full of our favorite things to eat for dinner. My daughter loves this because she gets to pick what we are having for dinner every night. She gets to pick from the 2nd box after dinner only if she sits in her chair during dinner without wandering off to the bathroom 10 times, to check on the dogs, or to do some other ridiculous non-sense that keeps her from sitting at the table. The second box has special fun stuff for her & I to do after dinner together. Like blow bubbles, ride bikes, go for a walk in the woods, paint our nails, play board games…etc. The 3rd box is full of fun family activities to do on Sunday. She only gets to pick a card from this box if she has been good all week(or so she thinks…we would do some kind of family activity regardless she just thinks she is in control of if we do something. It is working so.. shhh!). Activities include…visit the ponies, go to the zoo, ride bikes, go swimming…etc. Before the chore chart I would chase her around the house trying to brush and style her hair. It was really frustrating. The whole routine that should have taken 5 minutes would take 15 minutes. Now with the chore chart we are down to a happy 5 minute style and go…. I sound like an infomercial but, it really has made life so much easier. 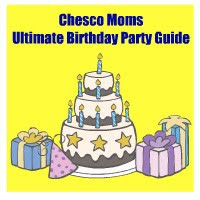 To purchase you very own Chore Chart or personalized calendar click here Please mention that you were referred by Chester County Moms! FYI…My little ones chores are: brush hair every morning, put toys away, sit in chair when eating, no whining, and be a nice friend.